Packaging company DS Smith is claiming it can provide a solution to the UK’s disposable coffee cup waste problem following research into potential reprocessing options for the hard-to-recycle item. With the UK’s disposable coffee cup waste topping 30,000 tonnes a year, equivalent to 2.5 billion cups, and only 0.25 per cent of these making it into recycling, calls for action to tackle the problem have been growing more urgent. After months of research, the company announced yesterday (19 March) that it believes it can recycle all the UK’s coffee cup waste at its paper mill in Kent. 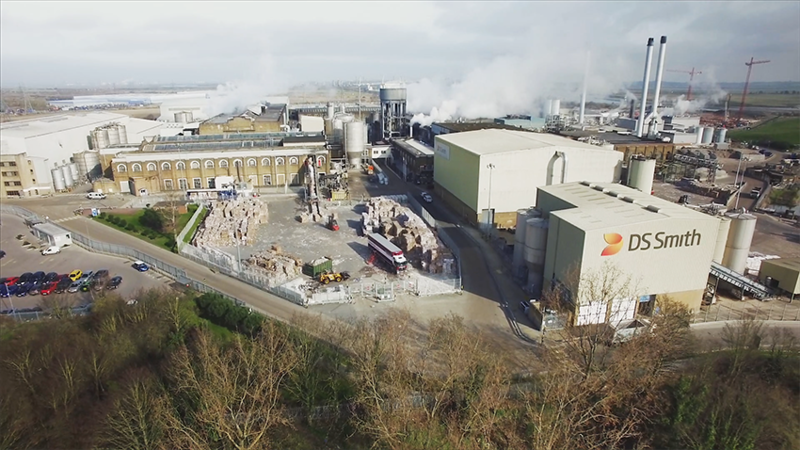 The Kemsley mill is the second biggest recovered-fibre paper operation in Europe, with an annual capacity of around 800,000 tonnes. This announcement is the culmination of industrial-scale research begun in January on behalf of the Paper Cup Recycling and Recovery Group (PCRRG), which tested the feasibility of making non-food contact papers from used coffee cups. Disposable cups tend to present an issue for reprocessors due to their mixed material composition - a paper outer surface coupled with a plastic lining - as well as the high potential for contamination in the waste stream. For these reasons, most do not accept the cups, despite many consumers being under the impression that they can be recycled, due in part to the widespread use of the Mobius Loop symbol on cups to denote recycled or part-recycled material. DS Smith has written to the PCRRG with details of its capacity, but has also called on the government to improve collection infrastructure in order to facilitate more recycling. Coffee cups are generally used on-the-go, but a lack of collection points in consumer hubs like train stations and shopping centres means that the items most often end up in residual waste bins. Peter Clayson, General Manager for DS Smith Recycling, commented: “We have been working around the clock to solve the throwaway coffee cup challenge, as enjoying a latte has become part of British culture. We could recycle up to two and a half billion cups each year, but we need the recycling collection infrastructure to be far better if we are to reach the goal of recycling every last cup. Debate has grown around whether the focus should be on improving recycling or reducing consumption, with Parliament’s Environmental Audit Committee (EAC) calling repeatedly for the government to introduce a 25 pence charge on disposable cups in order to encourage the uptake of reusable alternatives, with revenue from the charge going to fund the UK’s recycling infrastructure. However, the government response to the EAC’s recent report on coffee cup waste stated that it prefers to support voluntary commitments by retailers over legislative action. In other company news, DS Smith has recently expanded its European operations with the announcement of the €208-million (£182.5 million) acquisition of the combined paper and packaging businesses EcoPack and EcoPaper in Romania. More information about DS Smith’s coffee cup recycling campaign can be found on the company website. DS Smith has announced its involvement in a trial to analyse the feasibility of new recycling techniques for notoriously difficult-to-recycle single-use coffee cups.